New analysis from Evaluate Energy shows that 57 U.S.-based E&P companies have seen the present value of their global proved (1P) reserves fall by a combined 63% between 2014 and 2015, a staggering $515 billion. The full breakdown of the company data provided on an annual basis shows that the overwhelming majority of this fall in value is clearly linked to the commodity price downturn. 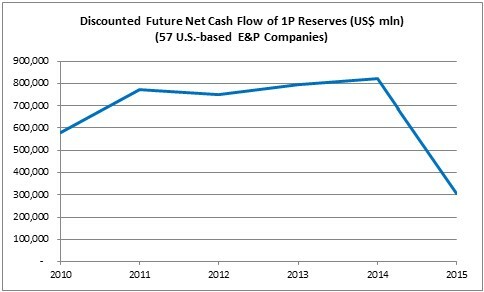 Every year, oil and gas producing companies based in the United States have to report figures in their 10-K annual reports under the heading “Standardized Measure of Discounted Future Net Cash Flows Relating to Proved Oil and Gas Reserves.” This section of each company’s report estimates the present value of its 1P reserves, based on a number of factors and subject to a 10% discount rate, due to the future-looking nature of the data in question (see note 1). This year, 57 U.S.-based E&P companies that have all been reporting the relevant data at least since 2010, saw the combined present value of their 1P reserves plummet to just over $300 billion due to the price downturn. An important fact to remember here is that these values are calculated using average commodity prices for each year. Were this data based on year-end prices, we would have seen a sharp fall in 2014 as well. But seeing as the price downturn did not begin in earnest until Q4 2014, the present value of reserves in that year were largely unaffected, and 2015, after a full year of low prices, saw a steep drop in values. 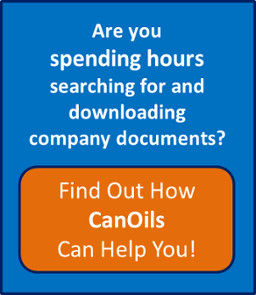 If we now look at the 2-year period from 2014 to 2015, an additional 7 companies can be added to the analysis that have only started to report the relevant data more recently than 2010. Out of the group of 64 companies, the full list of which can be seen here, it was EQT Corp. (NYSE:EQT) that saw the biggest drop in its discounted future net cash flows of 1P reserves, experiencing a drop of almost 80% to $978 million. Other notable companies in the group of 64 (not shown in the top 10 chart above) include ExxonMobil Corp. (NYSE:XOM), which saw its global 1P reserve value fall by 66% to $71 billion, Chevron (NYSE:CVX), which saw a 54% drop to $67 billion and ConocoPhillips (NYSE:COP), which saw a 69% drop to $26 billion. revisions being recorded in the company’s reserve reports. These two items would carry the majority of the impact of the price downturn on U.S. company reserve values. If we remove the negative impacts of revisions and changes in commodity pricing and production costs from each company’s discounted future net cash flow totals, the following ten companies would see their reserve values increase by the largest factor, thus identifying them as the companies that have had their reserve values hit hardest by the price downturn. The major takeaway from this is that every company has been affected; this top 10 chart alone includes a range in market capitalization values from barely over $1 million to over $48 billion. 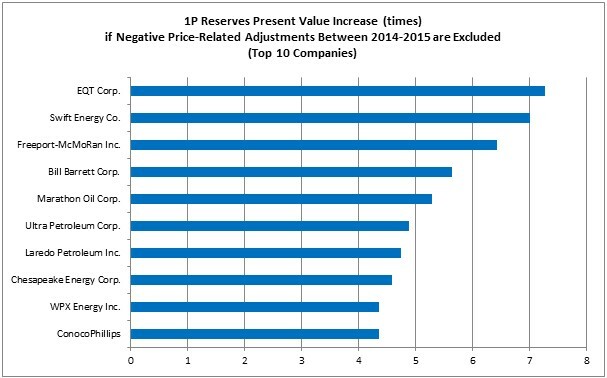 On average, the 64 companies would see their 1P reserve value increase by 3.2x if we removed the negative price-related impacts recorded between 2014 and 2015. Other notable individual companies in the group of 64 include ExxonMobil, which would see its global 1P reserve value increase by 3.6x if we remove price-related negative impacts, Chevron, which would see reserve value increase by 2.5x and Anadarko Petroleum (NYSE:APC), which would see reserve value increase by 4.0x. 1) The discounted future net cash flow is not a perfect indicator of the future value of 1P reserves, but rather an estimate based on a series of current factors (such as current development costs and current tax rates) and the average commodity prices for the year in question. 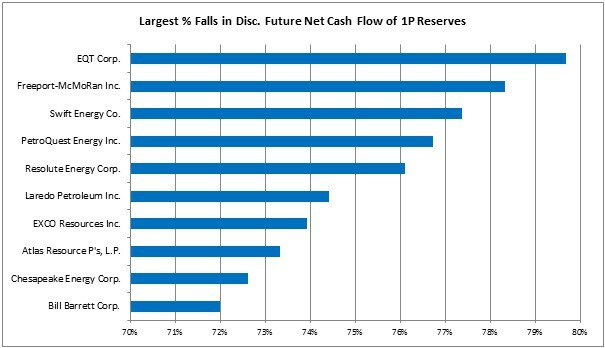 The discounted net future cash flow data throughout this report from each company always refers to the company’s global asset base. 2) The values in this chart were calculated by taking the reported discounted future net cash flow for each company and adding back the effect of a) the net change in pricing and production costs and b) revisions, as reported in the companies’ annual reports, in order to simulate a scenario in which these price-related impacts did not occur. 3) All data in this article was created using the Evaluate Energy financial and operating database.